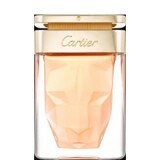 Cartier perfumery overflows with excellence, emotion and audacity, reflecting first and foremost an olfactory style that honours the designs of the Maison. As jeweller, gem-setter and lapidary, Cartier crystallises the fragrance around a central accord that stands out as the master gem of the work. Cartier fragrances are like precious jewellery and demand select raw materials that are of natural origin or the result of careful research. Emotion pours forth from these most noble of materials that endow the central accord of each perfume with uncompromising refinement, immediately perceptible as if illumined by the sparkle of invisible gems, a subtle composition of complex harmonies such as the lime of L’Heure Brillante VI or lily of Baiser Volé. Restraint, excess… this only leaves audacity, a capacity to revisit forgotten notes, to imagine unprecedented accords such as the incense notes of L’Heure Mystérieuse XII and the carnation note of L’Heure Convoitée II. Perfumer Mathilde Laurent has proudly continued this olfactory signature since she joined Cartier in 2005. Cartier fragrances leave an imprint of Cartier and style in their wake, unlocking all the pure, essential passion of a Maison that elevates perfume to the rank of invisible jewellery for the skin.